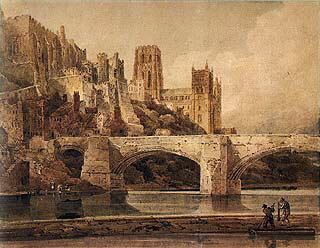 Thomas Girtin (1775-1802) has been credited as one of the founders of English watercolor painting. Raised by his draftsman stepfather, Girtin was apprenticed from 1788 to 1794 to the envious and authoritarian topographical artist Edward Dayes (1763-1804). He made finished paintings from the pencil sketches of other artists or talented amateurs such as John Henderson or James Moore. In 1794 Girtin made a sketching tour of the English Midlands with Moore, exhibited his first painting at the Royal Academy, and began his visits to Dr. Munro's "academy" (a practice he continued until 1797). Sketches made during his tour of Yorkshire and the Scottish border in 1796 became panoramic and picturesque watercolors that launched his career. In 1799 he was a founding member of the Sketching Society, formed to promote the development of historical painting (considered the highest form of painting by academic art theorists); artists in London met in the evening to improvise and then critique monochrome illustrations based on a literary excerpt chosen by the host. Girtin made several more sketching trips throughout England, was active as a drawing master, and took up oil painting in 1800. In 1801 he completed a 360 degree panoramic oil painting of London, the Eidometropolis, apparently intended as a money making venture. He had just finished the soft ground etchings for his Twenty Views of Paris, made during a year long trip to France in 1801-02, when he died in London of asthma at age 27. The name of Dr. Thomas Munro (1759-1833) comes up often in the history of English watercolors; he deserves a proper introduction. Chief physician to Bethlem Hospital and a specialist in mental disorders, Munro treated the insanity of King George III (1738-1820) and cared for John Robert Cozens during his last illness. Munro also inherited sufficient wealth and social status to pursue his true love, watercolor painting. He was an exceptionally talented amateur painter in the style of Thomas Gainsborough, counted artists such as Paul Sandby among his friends, and was an avid collector of watercolors by Gainsborough, Cozens, Michael Angelo Rooker and Thomas Hearne. In 1794 Munro moved to a new house on Adelphi Terrace (along the Thames), and there began welcoming talented young painters to his home on winter evenings. He supplied them with painting materials, lamps and desks, furnished drawings (from his own portfolio, or borrowed from artist friends) for them to copy, and paid "half a crown and a supper" for their work (he kept the copies for his collection). Through this informal "academy" went Girtin and Joseph Turner (Girtin did the drawings for Turner to color), John Varley, John Cotman, William Hunt and Copley Fielding, among many others. By his artistic mentoring, exposure to fine art and contemporary art theories, emotional and financial support (including free medical care), sketching excursions to his country home in Fletcham, and the social contacts he fostered among fledgling artists, Munro nurtured and shaped the development of three generations of watercolor painters. Dayes trained Girtin in the methods of the topographical tradition, and Girtin's early work includes a large number of architectural studies that recall aspects of Dayes's pen and ink wash drawings. Girtin however was one of the first to emphasize the horizontal breadth of his topographical views, as well as the effects of lighting and atmosphere of the place in which a famous building or ruin was located. His pencil drawing is a distinctive "dotted, glittering" web of nervous dots and hooked lines that suggests with a misty airiness the roughness, cracks and shadows of old stone. Girtin liked to present his subjects so that a single face or facade is bathed with oblique light, creating a large surface patterned with shadows. His Durnham Cathedral (1799, 42x54cm), one of the most popular architectural subjects of British artists, is a late example in this style. (Girtin visited Durham on his first sketching tour in 1794, but it was common for artists to work up paintings from pencil sketches done months or years before.) The touches of dark ink contrast with the flat white side of the bridge to suggest stone texture; dark and light weave complex patterns from the buildings and trees along the far hillside. Girtin's underpainting in warm earth pigment tints departs from the cool grays used by most topographers, and is a signature feature of all Girtin's work. (Another is Girtin's informed and deliberate decision to use fugitive blue, yellow and red pigments, which has turned almost all his surviving paintings into drab variations on brown, black and ochre.) The human figures are inserted for scale, and to provide a context for our own perspective on the picture, but otherwise are not very convincing. Girtin often had trouble with the picture foreground, and sometimes left it awkwardly bare: the tranquil, glassy passage of the Gaunless River, painted in horizontal bands of cool color after the manner of Dayes, helps to minimize the problem. But the main subject is monumentality, which Girtin emphasizes by exaggerating slightly the vertical profile and apparent mass of all the structures, a trick frequently used by Richard Wilson (and later by J.M.W. Turner) to lend greater drama to a scene. As an artist, Girtin was not interested in human character, calamitous weather or sublimely craggy peaks. Most of his mature paintings show humble rural villages or regional abbeys in the elusive light of a mist, a passing storm or the setting sun. As his style evolved, he orchestrated hues and values to give a dramatic weight to light and air, and introduced a more mannered upward or downward perspective in his views of picturesque subjects. 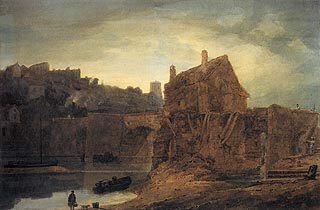 (Girtin's late, atmospheric style of painting was especially influential on the early works of John Sell Cotman.) In Bridgenorth, Shropshire (1802; 62x95cm) the tumbledown cottage and roofs of the town define the complex line between earth and sky (the distant tower introducing a hint of antiquarian interest). The foundation tints have been contrasted to separate the warm dark browns of the foreground hut and bridge from the cool dark grays of the water, hillside and sky. Girtin invests a lot of pen and ink detail in the surface of the toll house and the bridge, giving them the rugged and crumbly appearance that was a hallmark of the "picturesque" style, and creating a strong visual contrast with the broad effects of light and watery reflections that represent the embracing peacefulness of nature. Girtin seemed to enjoy inverting many of the conventions of the picturesque tradition: investing the same imposing height and painstaking detail in the drawing of this hut as he would in a medieval ruin, and thereby giving this common scene a timeless quality. The solitary figure is there not to lead the viewer into the scene but to introduce a note of human isolation or independence; the tendrils of smoke wafting up from the rooftops beyond the bridge are the only other signs of human activity. Girtin hints at many ideas about the place of man in nature, or civilization in nature, without making any of them sentimentally explicit. Girtin's late landscape style, apparent also in his wonderfully elegant and understated Paris etchings, favored broad horizontal vistas in which the principal subjects are sky and earth joined by a special kind of light. Consistent with this focus is Girtin's increasing tendency to flatten the planes of the image to create a two dimensional pattern, made even more decorative by a brighter palette, a wider range of colors, and a general suppression of fussy brushwork. The preliminary pencil drawing is broader and freer, omitting details and textures; sometimes an underdrawing is absent entirely. Girtin also used broad washes of pure color  layered from light washes to dark, and modeling shadows with darker values of the local color of the object rather than with gray, sepia or indigo  the modern technique that breaks definitively with the topographical style. (Again, these are technical innovations that also appear in the Swiss paintings of Francis Towne or the architectural paintings of Michael Angelo Rooker, and that Cotman and Turner carried even further.) At the time, Girtin's endless technical innovations, freer painting style and greater feeling for light and atmosphere gave him the edge in critical opinion over his friend Joseph Turner; indeed, Turner once said that "Had poor Tom lived, I would have starved." But the rivalry was entirely friendly. Martin Hardie relates a funny anecdote that when an art collector told Turner he had something exciting to show him, Turner exclaimed "What can it be, if it is not Tom's White House?" 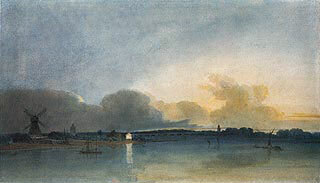 What impressed Turner about The White House at Chelsea (1800, 30x51cm) is the vibrant effect created by the small touch of light in a darkened surrounding, and the manner in which this light connects with the far sunrise to activate all the subtle gradations of value and near neutral colors on the page. This is a beautiful summation of Girtin's interest in atmosphere and transient light, and the effect of silvery reflections contrasted against masses of land or architecture; it exemplifies also his use of horizontal design, subtle coloring, flat pattern, and suppression of picturesque detail. But above all these things, it is a lovely portrait of the the mystery of passing time. Leap ahead in time a decade or two, and Joseph Turner has outstripped Girtin's memory in technical achievement, critical acclaim, artistic vision, and material success. But by most accounts, Girtin paved the way for the modern watercolor, and Turner's debt to him ran very deep. Even in 1842, while sketching high in the Swiss Alps, the old Turner reminded himself of a unique effect of light in darkness with a brief pencilled note in the margin of his drawing: "Girtin's White House." The standard reference for Girtin's life and work is the somewhat dated The Art of Thomas Girtin by Thomas Girtin and David Loshak (Adam and Charles Black, 1954), which includes 109 reproductions of his works and a complete catalogue raisonné. Greg Smith's exhibition catalog Thomas Girtin and the Art of Watercolor (Tate Gallery, 2002) provides a wide ranging and fresh look at Girtin's work and influence. Martin Hardie's chapter on Girtin in Water-Colour Painting in Britain: II. The Romantic Era (Batsford, 1967) offers a trenchant analysis of his technique and artistic achievement. An important selection of works, with excellent commentary, is available in The Great Age of British Watercolors by Andrew Wilton and Anne Lyles (Prestel, 1993). And try to find a copy of the exhibition catalog Thomas Girtin, 1775-1802 by Susan Morris (Yale Center for British Art, 1986), now out of print, for Morris's compact, alert and insightful essay on Girtin's life and work.